Hands up who got any sleep last night? New season eve is the up there with the night before EFW Oktoberfest to me in terms of excitement. I simply cannot sleep, thinking about whether this will be THE season when we actually win more games than we lose, go on a decent cup run, or win Golden Goal more than once in a season. For us Non League fans this is also an opportunity to see most of our players for the first time and actually see them for who they really are, rather than just A. Trialist. It is, of course, the only day of the season where we start joint top (and joint bottom), and are still in all of the cups. It all goes downhill from here. This is my fifth season as a Lewes fan. In that time we have been relegated twice, avoided relegation on the last day of the season twice and missed out on the play-offs on goal difference once. It hasn’t been the best of times to be a Rooks fan on the pitch, even though off the pitch it has been a marriage made in heaven. This season we are very quietly optimistic. A new management team, a virtually completely new squad and even a new programme editorial team (well, Barry Collins and me). 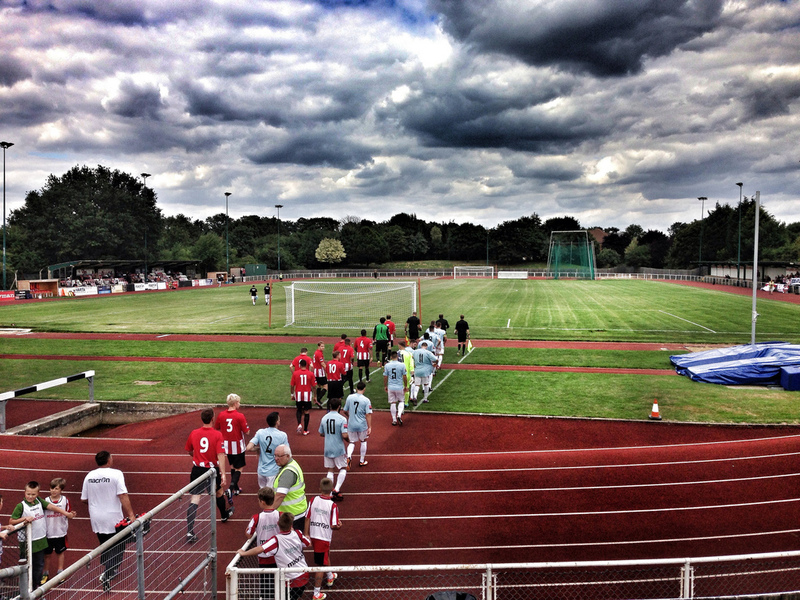 Of course, at 4:47pm today all that optimism may have dried up after our game at AFC Hornchurch. We tend to remember opening games more than most others in the season. I remember one of my first ever West Ham opening season games back in 1978 when they raced to a 4-0 lead against Notts County within 30 minutes. Of course I assumed they would go on to score 12, but they only managed one more. Remember Micky Quinn’s hatrick at Highbury back in 1993? Beckham’s goal versus Wimbledon in 1996? Hansen’s comments about “winning nothing with kids”? Greg Cane’s nightmare 20 minutes for Lowestoft v Lewes in 2011 when he scored an own goal from the half way line and was then sent off for arguing with the referee? Great memories. So what could we expect from this season’s curtain raiser? I’ve never seen Lewes win at AFC Hornchurch so the omens were not good. Granted I had only seem them play there once but stats don’t lie. The Urchins are one of my tips to be in the top five at the end of the season. Despite relegation at the end of last season I get the feeling that it was a mere blip in their long-term plan. Want to know who else I think will be up there? Go on then, just for you I will share my insight:- Maidstone United – the giants of the division in my eyes who will play in front of 2,000 other week in, other week out. Alas, unless the FA change their rules, they wont be able to take their place in the Conference South due to their 4G pitch. Ridiculous, but that story is for another day. Lowestoft Town – My tip for automatic promotion in past two seasons, both times missing out in the play-offs. Third time lucky for the Trawler Boys and their great fans. Bognor Regis Town – Disappointed last season but I get a sneaky feeling they will surprise a few this season. With the league expanded there are some new trips to look forward to. Many wont relish a trip to Thamesmead Town, but it is less than 15 minutes away for me so that is a great addition to the league and Dulwich Hamlet will be a brilliant away day with their fans. But back to today. With no Premier League games happening (apart from the ludicrous “Super Match” friendly between Man City and Arsenal in Helsinki – of course, Helsinki), the fans would be flocking to Non League games, right? Lewes’s record last season in Essex wasn’t good. Five games and just one win (ironically to play off winners Concord Rangers). Despite it being a new season, the facts were weighing on the Lewes Lunatic Fringe’s collective minds as we made the long walk from Upminster Bridge station to the Windmill pub, all 1 minute 34 seconds of it, before Terry uttered the words, “right whose round is it?” Welcome to the new season. 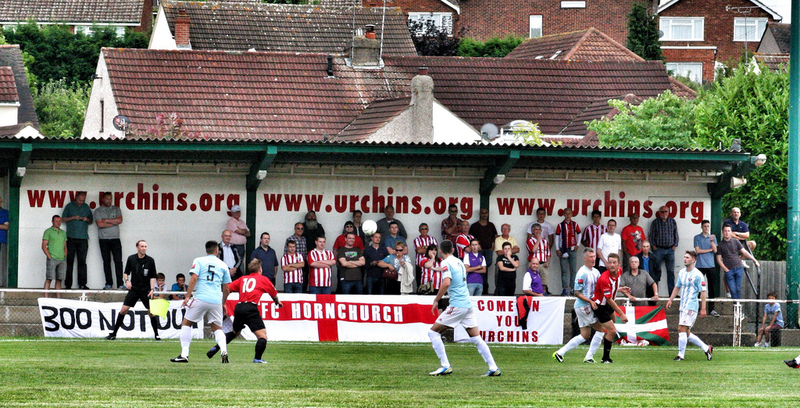 AFC Hornchurch 0 Lewes 1 – Hornchurch Stadium – Saturday 10th August 2013 Ninth place!!!! A 100% record and all we get is ninth place. Welcome to the ridiculous world of opening day league tables. Let;s not take anything away from the Rooks today. An opening day win, away to one of the teams that you’d expect to be at the top of the table is a good day out in anyone’s book, but the manner of victory was very pleasant too. Two years ago we came here and lost to a very physical Hornchurch side who were on their way to promotion. The irony today came with time ticking away and some of the home fans complaining about the Lewes “rough” tactics. This is a very different Lewes side, built with Scottish steel and Sussex craft. The only goal of the game was good enough to grace the hallowed turf of any Premier League ground. 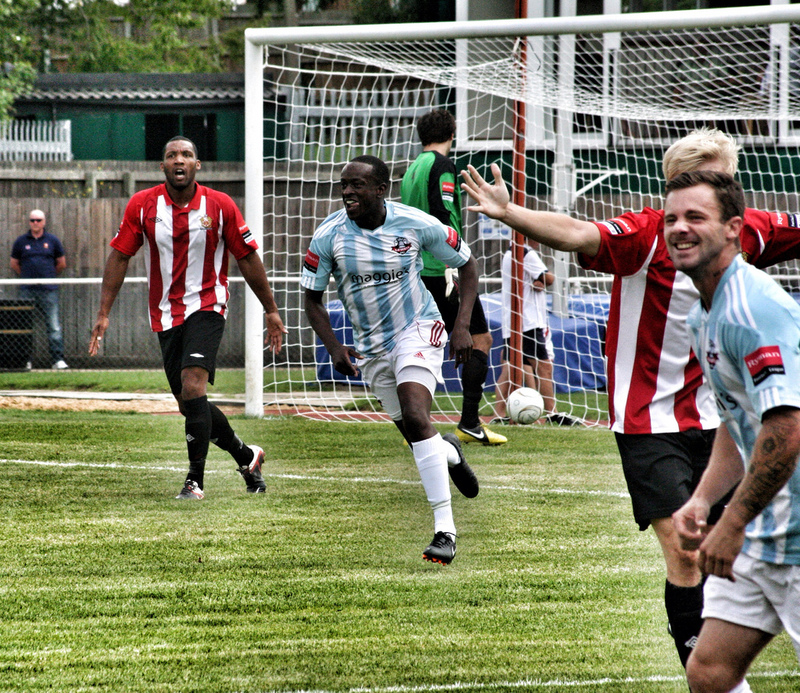 The Hornchurch left bank dithered, Jack Walder made a perfectly timed tackle then sent in a perfect cross for Ade Olorunda to head home. That will do for starters. So what was different from four months ago? Well, apart from nine of the outfield players, team spirit, organisation, a desire to fight for every ball and the sunshine, not a lot really. Football was back and about bloody time! Rikki Banks, sporting the most “visible” of goal keeper’s kits put his Sodoku down for a few seconds early in the second half to make a save but apart from that he was rarely troubled as the new centre-back pairing of Lovett and Pearson efficiently handled everything thrown at them. The two Jack’s, both sporting almost identical hairstyles in the centre of midfield snapped, snarled, closed down and kept the beat of the team up. And the thirty or so Lewes fans emptied the fridges in the bar of Speckled Hen. Despite what seemed like an hour-long second half, we held out. Being a Lewes fan means we have got used to false dawns, last minute disappointment and away days that never have a happy ending, so excuse me if I seem to over exaggerate a simple three points on the road. But Bloody Hell, we won! Away! In Essex! The opening day is one filled with false hope, one that passes quickly into the memory banks with the next game less than 72 hours away. All we could have asked from today was a few beers, some good banter and trousering three points. Mission accomplished. Until next week Essex when we meet again! Will De Bruyne become the Premier League's Neymar?